It's been a week, time to post again. Burgie is a little rough, looks like someone tried to roll it. is 63cagedfalcon a car or something else? LEON. Leon wrote: is 63cagedfalcon a car or something else? LEON. Built this in '05. Altered wheel base straight axle. That's nice, It's got that old AFX Gasser look to that was big in the 60's. What size Motor? LEON. That Hamm's Draft is an interesting sheet since it must have been for the "barrel-shaped" can--don't think they ever put one out as straight steel with that design. Looks in the photo like it's about the same height/width as the others, correct? Cool to see one of those flattened out! Beercanpete wrote: That Hamm's Draft is an interesting sheet since it must have been for the "barrel-shaped" can--don't think they ever put one out as straight steel with that design. Looks in the photo like it's about the same height/width as the others, correct? Cool to see one of those flattened out! Yes, believe it to be similar in size. Never thought about it, will check later. Every now and then, you will see one of these rolled into a straight steel can. 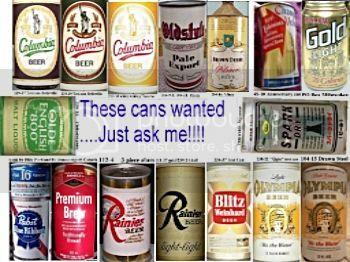 I've seen numerous rolled into 12 ounce, and a few that have been shortened (lengthwise) and rolled into a skinnier can can capped with 10oz lids. Sometimes they are billed as "test cans", so beware. I am not so sure about that. I have this can that has the smaller 10 oz. lid that came out of the Olympia archives via Premium Bill Mugrage back in the day. It has a seam that can not be replicated outside of the factory and the lids sure look original. It is an Olympia version and not a Hamm's but it is a factory produced can. Great to know I have something unusual.